Merseyside ( ) is a metropolitan county in North West England, with a population of 1,365,900. Taking its name from the River Mersey , Merseyside came into existence as a metropolitan county in 1974, after the passage of the Local Government Act 1972, and the county consists of five metropolitan boroughs adjoining the Mersey Estuary , including the City of Liverpool . Merseyside County Council was abolished in 1986, and so its districts (the metropolitan boroughs) are now effectively unitary authorities. However, the metropolitan county continues to exist in law and as a geographic frame of reference. Merseyside is divided into two parts by the Mersey Estuary : the Metropolitan Borough of Wirral is located to the west of the estuary on the Wirral Peninsula ; the rest of the county is located on the eastern side of the estuary. The eastern boroughs of Merseyside border Lancashire to the north and Greater Manchester to the east, and both parts of Merseyside, west and east of the estuary, border Cheshire to the south. The territory comprising the county of Merseyside previously consisted of the county boroughs of Birkenhead , Wallasey , Liverpool , Bootle , Southport and St Helens . Birkenhead and Wallasey were part of the county of Cheshire , whilst Liverpool, Bootle , Formby Southport and St Helens were part of the county of Lancashire . Merseyside was designated as a "Special Review" area in the Local Government Act 1958, and the Local Government Commission for England started a review of this area in 1962, based around the core county boroughs of Liverpool /Bootle /Birkenhead /Wallasey . Further areas, including Widnes and Runcorn , were added to the Special Review Area by Order in 1965. Draft proposals were published in 1965, but the commission never completed its final proposals as it was abolished in 1966. Instead, a Royal Commission was set up to review English local government entirely, and its report (known as the Redcliffe-Maud Report) proposed a much wider Merseyside metropolitan area covering southwest Lancashire and northwest Cheshire, extending as far south as Chester and as far north as the River Ribble . This would have included four districts: Southport /Crosby , Liverpool /Bootle , St Helens /Widnes and Wirral /Chester . In 1970 the Merseyside Passenger Transport Executive (which operates under the Merseytravel brand) was set up, covering the Liverpool and Wirral conurbations, but excluding St. Helens. The Redcliffe-Maud Report was rejected by the incoming Conservative Party government, but the concept of a two-tier metropolitan area based on the Mersey area was retained. A White Paper was published in 1971. The Local Government Bill presented to Parliament involved a substantial trimming from the White Paper, excluding the northern and southern fringes of the area, excluding Chester, Ellesmere Port (and, unusually, including Southport, whose council had requested to be included). Further alterations took place in Parliament, with Skelmersdale being removed from the area, and a proposed district including St Helens and Huyton being subdivided into what are now the metropolitan boroughs of St Helens and Knowsley . Merseyside was created on 1 April, 1974 from areas previously parts of the administrative counties of Lancashire and Cheshire , along with the county boroughs of Birkenhead, Wallasey, Liverpool, Bootle, and St Helens. Following the creation of Merseyside, Merseytravel expanded to take in St Helens and Southport. Merseyside is an amalgamation of 22 former local government districts, including six county boroughs and two municipal boroughs. Between 1974 and 1986 the county had a two-tier system of local government with the five boroughs sharing power with the Merseyside County Council . However in 1986 the government of Margaret Thatcher abolished the county council along with all other metropolitan county councils, and so its boroughs are now effectively unitary authorities. Merseyside however still exists legally, both as a metropolitan and ceremonial county. The two parts are linked by two road tunnels , a railway tunnel, and the famous Mersey Ferry . To express location within the Merseyside area by the preposition on – thus "on Merseyside" as opposed to "in Merseyside" – was traditionally the more usual. However, the logic of suggestions in support of this from some quarters (that, after all, one would always be "on” the side of the Mersey, not "in" it) falls down; since it is, in fact, entirely possible to be situated [both] "in" or "on" [either] “side” of the River Mersey and area(s) thus designated. Therefore, more recent usage tends to draw distinctions between the geographical "Merseyside" – for which "on" is considered appropriate – and the Metropolitan county of "Merseyside", for which "in" is used. MORI polls in the boroughs of Sefton and Wirral in the 2000s showed that more residents in these boroughs identified strongly to Merseyside than to Lancashire or Cheshire respectively (but was less likely to be "very strong" as opposed to "fairly strong"). 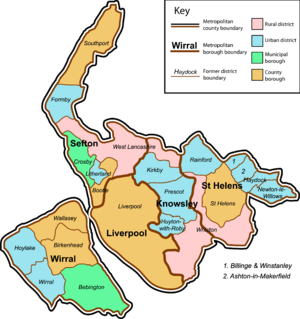 Merseyside contains the metropolitan boroughs of Liverpool , Knowsley , Sefton, St Helens and the Wirral. Several organisations are still recognised using the old name of "Merseyside". The court service at Liverpool's Magistrate Court for example, registered the domain merseysidemcc.org.uk on 25 March 2000, more than a decade after the Merseyside Council was abolished. This is a chart of trend of regional gross value added of Merseyside at current basic prices published (pp.240–253) by Office for National Statistics with figures in millions of British Pounds Sterling. Other nearby towns are not part of Merseyside, such as Skelmersdale , Ormskirk , Warrington , Runcorn , Widnes and Ellesmere Port , but the designation "Greater Merseyside " has sometimes been adopted for Merseyside and these six towns unofficially. This also has a semi-official usage by some local authorities and organisations and is used by Geographers' A-Z Map Company for their Merseyside Street Atlas.However, a separate 'City region', comprising Merseyside and Halton , has some official recognition as being Greater Merseyside, although it has also been referred to as Liverpool City Region . Office of National Statistics – Gazetteer of the old and new geographies of the United Kingdom, p48. URL accessed 11 March 2007. Metropolitan Counties and Districts, Beginners' Guide to UK Geography, Office for National Statistics, 17 September 2004. URL accessed 11 March 2007. North West England Counties, The Boundary Commission for England. URL accessed 11 March 2007. Sefton poll, where 51% residents belonged strongly to Merseyside, and compared with 35% to Lancashire; Wirral poll, where 45% of residents belonged strongly to Merseyside; compared with 30% to Cheshire. In both boroughs, "very strongly" ratings for the historic county were larger than that for Merseyside, but "fairly strongly" was lower.